Perhaps M. Night Shyamalan has really found his way back. The story of M. Night Shyamalan is almost as interesting as any of his movies. He started out with some of the greatest films made such as The Sixth Sense, Unbreakable and Signs. People were calling him the next Spielberg. Then, he seemingly lost it as he started to make pretentious films, banking on his penchant for having “twists” at the end. Films such as The Village and Lady of the Lake dropped his stock. Then, he made some of the most truly awful films ever made such as The Last Airbender, Devil, The Happening, After Earth (a film where they did not even put his name on it). He went from the next big thing to the punchline of a joke in just a few years. After Split, Shyamalan has had his second straight film that was pretty good (following The Visit) and perhaps he has righted the ship after all. 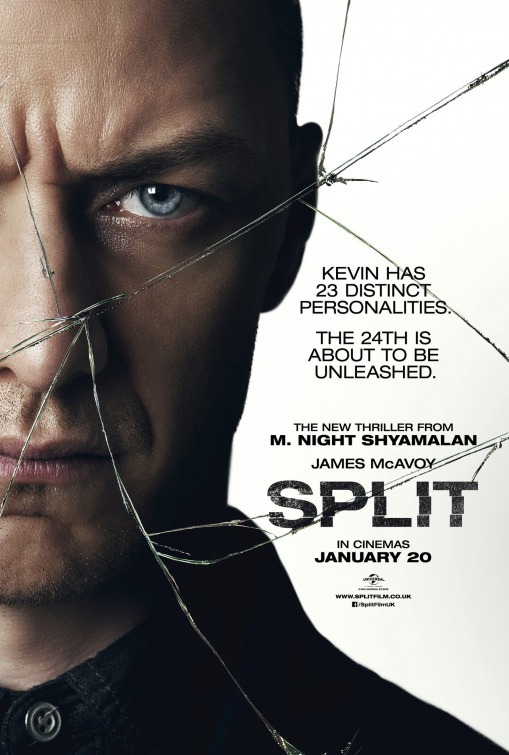 Split tells the story of three girls who get abducted by a man (James McAvoy) who has D.I.D. (dissociative identity disorder). We discover through his interactions with his therapist Dr. Fletcher (Betty Buckley) that “Kevin” has 23 distinct personalities. More than that, Dr. Fletcher is convinced that the D.I.D. patient might have special abilities specific only to that personality. She talks about the people who have D.I.D. might be the next evolution of the human race. That was a fascinating concept and it does pay off in the movie. However, she has no idea that personality Dennis has abducted the girls and has been having discussions with personality Patricia (including rapid fire clothing changes). Among the girls, Casey (Anya Taylor-Joy) is our main protagonist. She is a loner and a depressed teenager, but she handles the situation of the abduction so much better than the other two girls that you knew something was up. We see some flashbacks to her childhood with her father (Sebastion Arcelus) and her uncle (Brad William Henke) and we understand why Casey is the way that she is and why she reacts to this situation in such a different way than the other two girls. Anya Taylor-Joy was another highlight of the film for me. Casey is able to connect with another personality, Hedwig, who is like a nine year old boy. Hedwig is able to take control of the body (they call it “coming into the light”) any time he wanted. Casey tries to get Hedwig to let her go, but he is afraid of what Dennis and Patricia will do. They have brought these girls here as a sacrifice for “The Beast,” which we know little about but we believe may be a 24th personality. James McAvoy is utterly brilliant as this character. He plays each personality distinctly differently and you can see how different they are. He shows you the innocence of Hedwig and the manipulative nature of Patricia. But McAvoy does not just play this guy as a villain as you can see in the almost sweet relationship that he has with Dr. Fletcher. There is a kindness when talking with her and he really believes that she can help him. Unfortunately, Dennis and Patricia seem to have become the stronger alters. There is a lot of tension in the story, but I have to admit that without the unexpected “reveal/twist” at the end of the movie, Split would have only been an okay film for me. This ending made it a much better film and it did catch me off guard. I won’t spoil it here. but I can practically guarantee that you will never see it coming. The ending really changed the way you perceive at the rest of the film and it helps make things that had come prior make sense. Split is one of those movies that you may need to revisit after seeing it once to actually see what things you may have missed upon first viewing. I have to say that I appreciate when a director and a film can catch me unexpected, especially in this world of social media and internet spoilers. Perhaps M. Night Shyamalan has actually turned a corner and returned to form. Hopefully, he learned a lesson and he can continue to give us compelling films that challenge us and keep us guessing.